The frantic pace at which I live my life doesn’t always allow for reading – one of the things I enjoy most in life. Eager to find a way I could continue my march through life but also fit in a good book or ten, I decided to give audio books a go. I started with Success Intelligence by Robert Holden. Pete, a friend and colleague recommended Robert’s work and assured me that I would be inspired by what he had to say. Seizing the opportunity to give my new time saving approach a go, I ordered the book on CD and transferred the tracks onto my iPod the first opportunity I got after they arrived in the mail. It was a success; not at all disappointed I found myself listening to Robert Holden talking about Success Intelligence in the car, walking to meetings, sitting on planes and even while pottering around in my garden. I found it ironic that of all the books I could have chosen, I selected this one to try out my new strategy for squeezing more into my already busy life. Among other great lessons Success Intelligence teaches the importance of slowing our lives to a pace where success is not only possible but can be truly appreciated. Fundamentally it is about how to enjoy real, soulful success while living in a manic, busy and hyped up world. Robert Holden, PhD., is the Director of The Happiness Project and Success Intelligence. His innovative work on happiness and success has been featured on Oprah and in two major BBC documentaries. Hailed as one of the most effective coaching programs in the world, Success Intelligence has been used by leaders around the globe including those working at iconic brands like Virgin, Coca-Cola, and IBM. Robert’s approach has become well known for the impact it has on the happiness and performance of seemingly already successful people. Aimed at unveiling the heart and soul of success, Robert argues that for us to be truly happy we must first define what success means to us. This notion of authentic success suggests that to reach it we must first understand the essential measures that inspire us on a deep personal level. Throughout the book Robert tells stories of the work he has done with people around the world to help them better define and ultimately achieve success. As these stories revealed, success persistently eludes some people who never feel they have reached the end where they believe success is waiting. In many of these stories, Robert describes how their focus on money and material possessions led to a sense of emptiness and lacking in their lives. Each had a blurred view of what truly had meaning for them and ultimately defined true success in their lives. Robert talks about the Success Contract; an agreement we unconsciously make with ourselves about what it means to be successful. To reach true success, he stresses the importance of not only recognising but also dealing with our self-limiting patterns and beliefs. In order to be successful, Robert suggests not only must we overcome the things that most commonly block us, but we also need to be who we really are. Success can only be reached if we learn to share our strengths, gifts and talents with the world. Waiting for my flight home from Hobart recently, I was strolling around the airport bookshop trying to kill time. Richard Branson’s new book jumped out at me and soon I was contemplating adding it to the growing collection of books on my ‘must read’ pile. Not only did I decide to buy the book but I couldn’t stop reading once I began. While usually I would hope for a quick flight home with no delays, I found myself hoping we would circle around Melbourne a while so I could get a few more pages read. If you haven’t done so already I strongly recommend you read Richard Branson’s “Screw Business as Usual”. It’s refreshing and exciting to see someone in such an influential position speak intelligently and passionately about the role we must all play to improve the future for our world. Richard believes businesses should be asking themselves what they are doing to make a difference and how they can do more. It’s great to read Richard’s pragmatic, balanced and grounded views; about the health of the planet, quality of life for people around the globe as well as what we need to do about it. Richard believes changing the world isn’t just about handouts – to lift billions of people out of poverty, opportunity and resources are needed. While money is important, so too are hope, belief, skills and a ‘foot in the door’ that those more fortunate amongst us can provide. Richard talks extensively about the work of Virgin Unite and others supporting entrepreneurs in villages around the world to establish and grow their own businesses. Not only are they creating income streams for individuals and their families, the growth of these small enterprises are creating jobs for others. It’s tempting to think these things easy for someone in Richards’s position to say, but his book fills me with confidence in his intention and determination to make a difference. The book left me inspired by Richard’s drive and clear commitment to offer not only his resources and influence but also his knowledge and skills to tackle some of our world’s biggest issues. 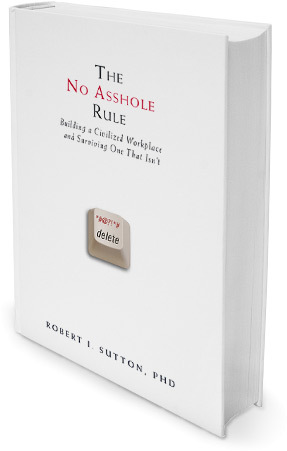 Robert Sutton first began to tell the world about the impact of assholes in the workplace through an article published in the Harvard Business Review. Written in frank language (as the title intimates) he articulates what I believe is an undeniable fact: the modern workplace is beset with assholes. Sutton, a professor of management science at Stanford University, argues that those who deliberately make others feel bad about themselves and project their ordinary behaviour on those less powerful — are toxic in the work environment, dramatically diminish productivity and performance and are the reason why many capable team members choose to leave. Regardless of how great they are at their job, Robert makes one solution very clear – they have to go. During the eight fabulous years I worked with Vanguard Investments I had the opportunity to participate in the Six Sigma program. 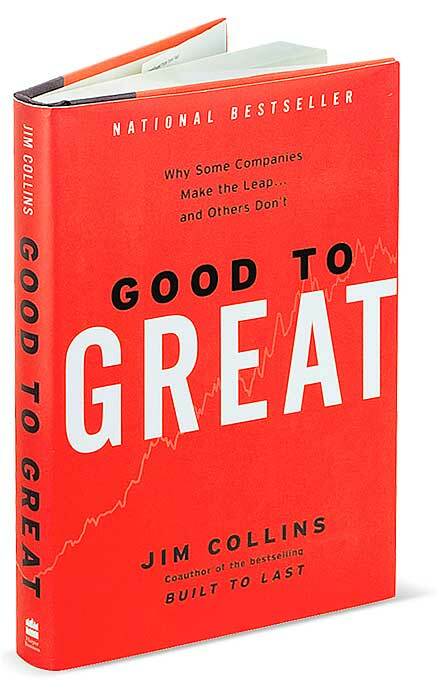 One of the books on the program’s compulsory reading list was Good to Great by Jim Collins. It remains today one of my favourite books. Based on extensive research, Good to Great describes how businesses transition from being average to great and how some fail to make the transition. Key to his work, Jim defines “greatness” in terms of financial performance several multiples better than the market average over a sustained period. In other words, to make the list of great companies it wasn’t good enough to have anecdotal evidence and achieve the heights of performance he describes for a narrow window of time. To make the cut, the numbers needed to impress, and the organisation needed to have experienced a substantial uplift in performance that was sustained over at least 15 years. Hedgehog Concept: three overlapping circles: What makes you money? What could you be best in the world at? And what are you excited about? Or as I heard someone once put it, what lights your fire? Technology Accelerators: using technology to accelerate growth within the three circles of the hedgehog concept. The Flywheel: the additive effect of many small initiatives which act on each other like compound interest. Good to Great offers so much more than this brief snapshot – I could write a book about this book! Towards the end of the 1990’s I was given a book that turned out to be the first of a number of books authored by Daniel Goleman that I have read. As you may be aware, Daniel Goleman is a pioneering contributor to what has become undoubtedly one of the most important advancements in management theory in the last 15 years. Working with Emotional Intelligence takes the concepts from Daniel Goleman’s bestseller – Emotional Intelligence – into the workplace. Daniel argues that business leaders and top performers are not defined by their intellectual capabilities (IQs) or even their job skills. 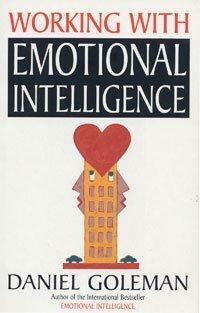 Rather the book and its forerunner present compelling arguments that “emotional intelligence” is what primarily drives success not only in business but in life. Emotional intelligence can be defined as a set of competencies that differentiate how effectively people manage their own feelings as well as interact and communicate with others. Extensive research and analyses done by many experts in corporations, government departments, and the not-for-profit sector globally support Daniel Goleman’s conclusions that emotional intelligence is the barometer of excellence on virtually any job. Working with Emotional Intelligence clearly explains what emotional intelligence is and why it counts more than IQ in enabling someone to excel. It details 12 personal competencies based on self-mastery (such as accurate self-assessment, self-control, initiative, and optimism) and 13 key relationship skills (such as service orientation, developing others, conflict management, and building bonds). To add colour beyond the data, the book includes many examples and anecdotes which illustrate how competencies lead to or undermine success.